White Chickpeas Curry / Chana Masala | Simple and Delicious ! 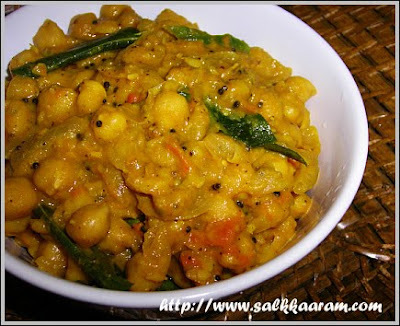 Cook chana with salt and enough water until soft. Heat oil, splutter cumin seeds and mustard seeds. Saute onions till golden.Stir for a while after adding garlic ginger paste. Then add chopped tomatoes, green chillies, curry leaves and coriander leaves.Let the tomatoes cooked and add little salt. Add all powders. Make a thick masala and mix the cooked chana with this.Add a little of the remaining water used for cooking chick peas in this.Let it boil on a low flame. You can prepare this by adding thick coconut milk like green peas curry here. Have never tried any gravy with coconut milk...always the usual tomato paste.. The coconut milk sounds like a nice idea. Channa looks creamy. Looks delicious seena,love the colour!! Made this last night..Usually I add cornflour to thicken the gravy, but this time on your suggestion, I used coconut milk and it not only was thick but creamy and much tastier as well!! thanks for this recepie......tried it & came very good.